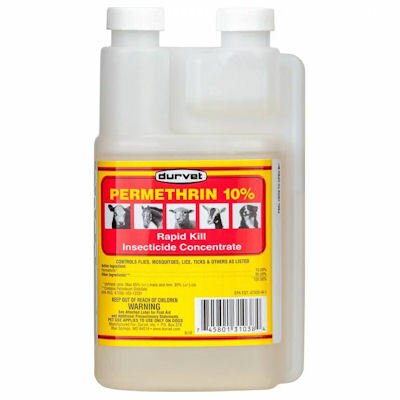 Permethrin 10% Concentrate - Sale Price 19.88/32 ounces liquid conc. Permethrin 32 ounce 10% Concentrate (Durvet) contains 10% Permethrin for quick knockdown and long lasting control of flies, mosquitoes,mites, lice, ticks and fleas. For use on horses, dogs , cattle, sheep, goats, swine, and poultry. Safe to spray the premises. For use on dogs 12 weeks of age and older mix 1.3 ounces with every 1 gallon of water, For use as a horse spray dilute 8 ounces in 50 gallons of water, or one 32 oz. container makes 200 gallons.